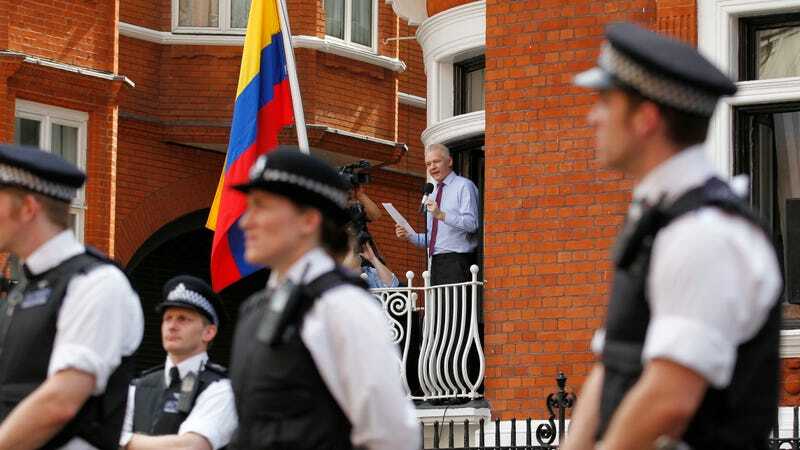 Assange surrounded by police outside the Ecuadorian Embassy in 2012. The government of Ecuador, whose embassy in London has served as a refuge from UK authorities for Wikileaks founder Julian Assange since 2012, has been growing weary of their guest for quite some time. According to a Friday report from Reuters, it even went so far as to try and name him to a diplomatic position in Russia but backed down after Britain refused to grant Assange diplomatic immunity. In preparation to become an Ecuadorean diplomatic official, Reuters added, Assange penned a letter retracting his request for political asylum that Vintimilla insists means the Wikileaks founder should be kicked out of the embassy. While Wikileaks published the stolen emails (including ones from the Democratic National Committee and Hillary Clinton’s campaign), Assange has vehemently denied he received them from Russians or that he colluded with the country’s intelligence services. Officially, UK authorities are seeking to capture Assange for breach of bail conditions imposed over since-dropped charges of sexual assault in Sweden. Though his health is reportedly in decline after years locked in the embassy (and his mental state questionable), Assange’s legal team say that UK police are in reality simply trying to scoop him up so he can be sent to the US, where top officials have made no secret of wanting his head on a platter. The Associated Press reported earlier this month that Assange had sought a Russian visa as early as 2010; it’s unclear whether he actually received one, though if he did it came too late to allow his escape from the UK. Even making it to Russia would have its own risks; fellow whistleblower Edward Snowden, who leaked a cache of National Security Agency documents in 2013, has sometimes been described as living freely there only at the whims of the Kremlin. Vintimillia said at a press conference (Spanish) in Quito on Thursday that Assange’s citizenship should be rescinded. She also said that it is not clear precisely what legal status Assange has, as he appears to have withdrawn his asylum claim as of December 4, 2017, just eight days prior to his being granted citizenship. Vintimilla also noted that Assange’s naturalization documents “mysteriously” lack the signature of then-Foreign Minister María Espinosa. It seems increasingly unlikely under the mounting pressure that Assange can remain holed up in that embassy for very long, though prior reports the axe was about to drop have failed to pan out.